Milton Wright Masters and his wife Melany bought 338 acres of hills and hollows just outside Eureka Springs in 1927 for $700. Mr. Masters is reported to have been a kind, progressive man. At a time when children were seen more than heard, he encouraged conversation with them at the dinner table. We have a small part of his farm. Our little farmhouse in the hollow was built about 75 years ago as a replacement for a much larger home of his which had burned. Besides the house, we also have the barn and other outbuildings. The main spring behind our house is said to have never gone dry and it supplies our water, just as it did for the Masters family. Before there was electricity at the farm, Mr. Masters built a spring house to cool their food and farm products. He had several kinds of livestock and grew various types of produce, everything from potatoes to apples. The Masters were especially known for their strawberries and people came from miles around to pick their own or to buy from the family. During the Great Depression, when the farm wasn’t paying enough to get by, Mr. Masters took employment at the ice plant in Eureka Springs. He worked the night shift and farmed during the day. Because it was summer and he had a house full of kids, he had trouble getting any sleep. Luckily, down the hollow is a small cave under a sizable bluff. Milton Masters put a bed in the cave and had a nice cool quiet spot to rest. In the spring flowing behind our house, there are little bitty crawdads. I’ve not seen one for awhile, but I trust that they are still lurking in the water. I’m glad that they are there, as I’ve read that crawdads are an indicator of healthy water. As you probably know, if you played in creeks as a kid, crawdads are small crustaceans, miniature freshwater lobsters with pincers. Though usually called crawdads in the Ozarks’ vernacular, they’re also called crayfish, crawfish and mudbugs. When I was young, my Uncle Dana Scott came over from Rogers and took some of us out to catch crawdads. The way I recall it, we walked several creeks that day carrying buckets, looking under rocks and logs until we’d caught a mess of them to eat. We used our hands to catch them and, with practice, I didn’t get pinched. Dana cooked them up and they were quite tasty. There are supposed to be approximately 60 different species of crawdads in Arkansas, and most are found in the cold springs and creeks of either the Ozarks or the Ouachitas. They come in a variety of sizes and colors: the ones in my spring are brown and smaller than two inches. Bigger ones can also be found, though. Local outdoorsman Jared Mourglia has caught crawdads in the 8 inch range. Wearing goggles, he dove into Kings River and captured them by hand under the piers of the old US 62 bridge. I believe crawdads that large would have to be the long-pincered variety that are found only in the White River Basin of Arkansas and Missouri. I’ve read that some experts say the long-pincered crawdad is the largest in North America. While catching crawdads by hand is always an option, I’ve heard of others locally using baited traps to capture these big crawdads by the dozen. Though commercial operations are more common in Louisiana, Arkansas does have crawdad farms. The crawdads are raised as food and, prepared correctly, they not only taste great, but are very high in Vitamin B12, which is essential for proper brain function. This photograph of George O’Connor of Eureka Springs, Arkansas was taken November 25, 1950. 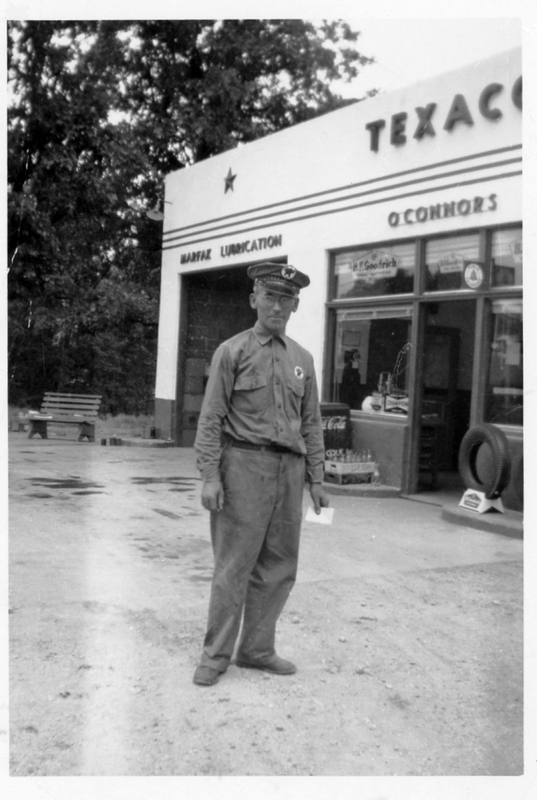 He is standing in front of his business, O’Connor’s Texaco Service Station. He was 49 years old. This photograph was provided by Susan Willard of Kansas. It was on November 25, 1950 that George O’Connor, a Justice of the Peace, married her parents. If you know my Uncle Arlie Weems, then you probably know that he conducts morning office hours at the top of Stadium Road and has done so for as long as I can remember. His office is his Chevy pickup. Anyone can pull up and roll down their window, or maybe stand around depending on the weather and other factors. There are some gravel piles and usually a dump truck and backhoe there. If you don’t know Arlie, then you need to know that he has the reputation as a virtuoso with a backhoe. I’ve been told several times by various people over the years that he is an artist when using his machines. On this particular day, I wanted to ask him what year he drank his first can of Mountain Dew: I was thinking about writing a column about the beverage. I’ve always associated Mountain Dew (the carbonated version) with the Arkansas Ozarks. As a kid, I don’t recall people drinking Mountain Dew in the Washington DC suburbs, or overseas, but when we’d come home to visit, there’d be someone drinking it. Often, it was Arlie. So I asked him my question and the answer was this: in about 1965, a man named Nolan Brisco was driving the Pepsi truck out of Harrison and he stopped at the DX station where Arlie was working and gave him a free sample of Mountain Dew. Arlie has been drinking it ever since. The DX was the service station located about where the Subway is now on US Highway 62. Nolan Brisco is still around. He owns ABC Signs and Advertising in Harrison. The other interesting thing we talked about was a prior day’s event that occurred south of town. Arlie had been backing a Mack dump truck when it inexplicably wouldn’t stop. He tried all the tricks a person with 50 years experience knows, but nothing slowed it down. After the truck turned over, he climbed out. He said he wasn’t really shook up, unlike the first time he flipped a vehicle several decades ago. It wasn’t his first rodeo, as they say. On December 6, 1993, I stopped by my grandparents’ farm for a minute. I was home from college and I made notes of my visit that day, not because it was extraordinary, but because it was typical. Jack and Betty McCall believed in hard work and expected everyone in the family to pitch in and help. I knew I ran the risk of having to help with chores. Just after I arrived, Uncle Arlie Weems drove up in a dump truck and dropped a load of gravel for the farm lane leading to the county road. Though I thought I was in a hurry, I ended up helping Betty smooth gravel for two hours. She was just shy of 80 at the time, but she worked me into the ground. She invited me to stay for lunch. Jack’s health was deteriorating, but he still had work that had to be accomplished, so after we ate, I changed the spark plugs in his Ford pickup. Since the hood was up, he had me replace a radiator hose, too. He decided he needed some O-rings, so we left for town. At the highway, the carburetor kept flooding, so we stopped and put the hood up again. Shade Hadley stopped and helped, but we still were unable to diagnose the problem. Since we were blocking traffic on Rock Springs Road, Jack rolled the truck backwards down the road until it would roll no more. Betty happened to drive by and stopped and picked up Jack. He returned, chugging along on his ancient Farmall tractor and towed the pickup back to the farm. He still wanted O-rings, so I drove him to Kimes in my vehicle. When we arrived back at the farm, Jack called his son Sherall, a mechanic, and was told to blow out the carburetor as there might be trash in it not allowing the needle to seat. That fixed it. By then it was time to put out hay for the cattle. I left tired and dirty, but feeling good. 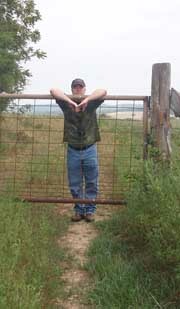 At the time, it never occurred to me that days like that would come to an end on the McCall farm.